The Most Popular Desktop and Mobile Browsers | ASTRALCOM - Content Strategy, Conversion Marketing and Customer Acquisition. If your website only works on Chrome, while you’re likely to reach a large part of your customer base, there is a lot of traffic you will be missing out on. In the modern age, cross-browser compatibility is a must for all websites, on both desktop and mobile. According to the data report by NetMarketShare for December 2017, Google Chrome is still the leader when it comes to being the most preferred browser on mobile and desktop. The pronounced dominance by Chrome totals 60% of the market share both on mobile and desktop. For mobile devices, however, Safari, installed as the default on all Apple products, comes in a relatively high second place, with all other mobile competitors seeing very minimal use. For desktop use, however, Safari falls behind both Internet Explorer and Firefox. Though Firefox is used slightly less than Internet Explorer, usage of IE can be expected to fall over 2018 as more Microsoft users turn to Microsoft Edge. Microsoft Edge is currently just behind Firefox for total usage, with Safari, Sogou Explorer, Opera, QQ, UC Browser and finally Yandex compromising the rest of the top ten. 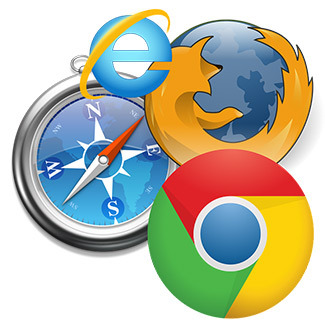 Edge and Safari, the default browsers for modern Windows and Macintosh computers respectively, are the browser of choice for roughly 4% of users, while the remaining browsers see less than 2% of usage each. While Chrome is distinctly the cross-platform browser of choice, websites that do not function properly on Safari, Firefox, IE or Edge are going to miss a significant portion of the public. About 40% of both mobile and desktop users will be using one of these browsers, and a website that doesn’t function properly across browsers looks unprofessional and untrustworthy, driving customers away from your business. MyBroadband reports the exact findings for Browser Usage as of December 2017 in this article, a must-read for anyone with an online presence. Your website must perform well on all browsers, including loading quickly. In a related post, I recently discussed how the need for optimum efficiency is paramount when a user accesses your site through mobile platforms. Connect with us today so we can show you how we can improve engagement with your audience through effective delivery of your message, including optimal functionality of your website on desktop and mobile.